The food is good here. At BSU you’ll find a great selection of dining options that are convenient and flexible. 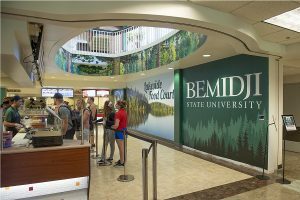 Dining Services offers traditional American cuisine, globally inspired dishes, and national brands at our on-campus locations that include Northwoods Cafeteria, Papa John’s, Lakeside Food Court, ecoGrounds coffee shop and Einstein Bros. Bagels. Wally’s (A.K.A. Northwoods Dining Center) is located in Walnut Hall and its all-you-care-to-eat cafeteria setting provides a wide selection of menu choices. It’s got convenient hours and is open seven days a week, except during semester and holiday breaks. Lakeside Food Court is in Lower Hobson Memorial Union. It features homemade bakery products, fresh soups, cold and hot sandwiches, fresh tossed salads, pasta, pizza, Asian fare and made-to-order wraps from Jump Asian Express Cuisine, Caliente, Montagues, Grille Works, Toss It Wrap It, Noodles, Papa John’s Pizza, and Kettle Classic. ecoGrounds is located in the Terrace Lounge in Upper Hobson Memorial Union, offering a full range of coffees, espresso, smoothies, sandwiches, and Grab ‘n’ Go items. Einstein Bros. Bagels, in Lower Hobson, has a wide variety of bagels and spreads, as well as hot and cold sandwiches, salads, soups, espresso, pastries and more. The Lodge is a convenience store in lower Walnut Hall, stocking groceries, snacks, frozen foods and school supplies.